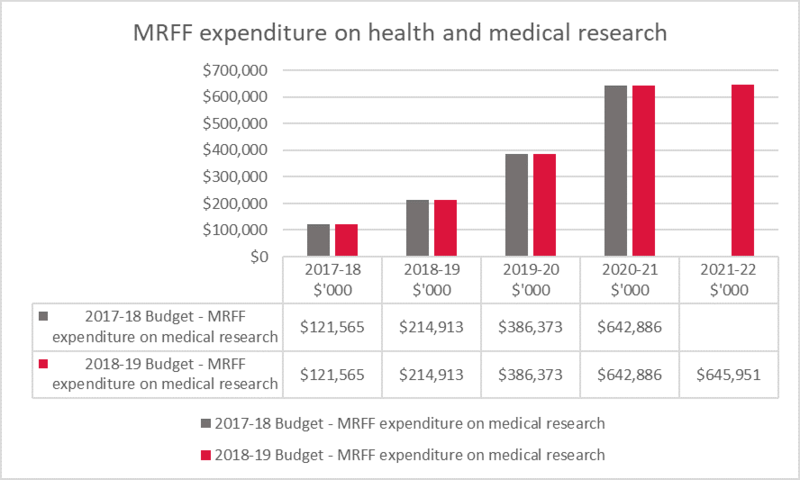 AAMRI > News & Events > AAMRI News > 2018-19 Federal Budget – what’s in it for medical research? 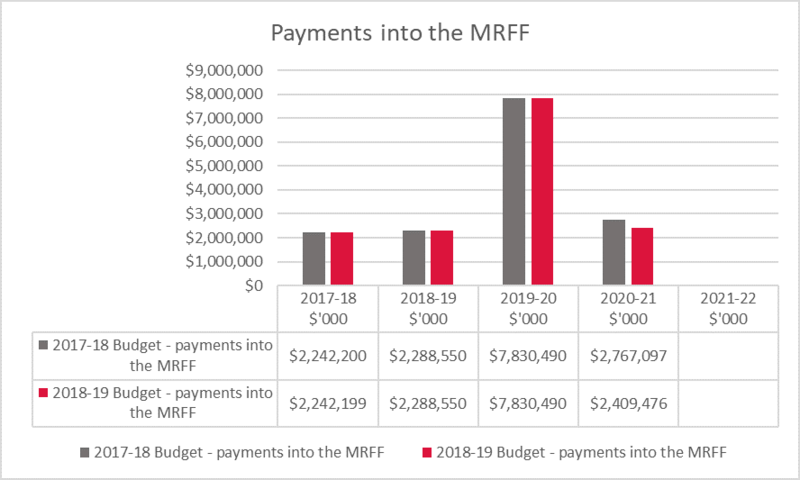 There was also good news for research infrastructure with just under $400 million of new funding announced to implement the National Research Infrastructure Roadmap. While the sector had been fearing the worst with respect to changes to the R&D tax incentive there was some good news in an exemption being granted to clinical trials. 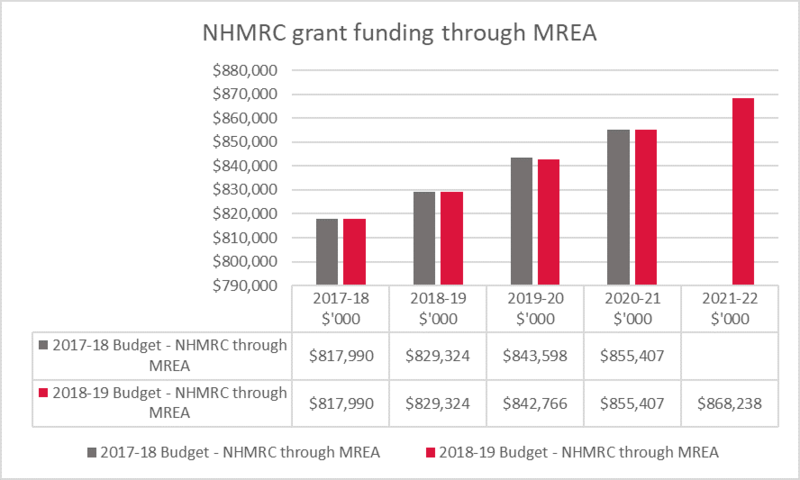 There were no significant changes to NHMRC, ARC or university research block grant funding, and there were a few other smaller announcements of note. AAMRI has been through the Budget papers and compiled a summary of all the major points of importance in the Budget. A pdf version of this summary is also available below. 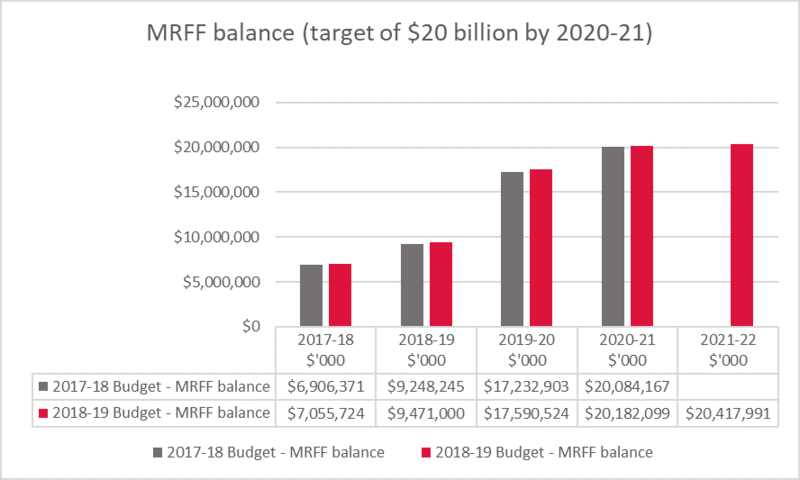 The Budget provided details on the $2 billion medical research investment from that is set to be made by the MRFF from 2017-18 onwards. Women’s Health – $17.5M over four years from 2017-18 for research into Women’s Health and research into Maternal Health and First 2,000 Days to address the underlying social determinants of health that impact on a child’s early days in life. The Government has maintained its commitment to build the fund to $20 billion by 2020-21. Payments into the fund are in line with previous forecasts with no significant difference. There were no significant changes to medical research funding through the NHMRC Medical Research Endowment Account. Slight inflationary increases are provided for in the coming years. 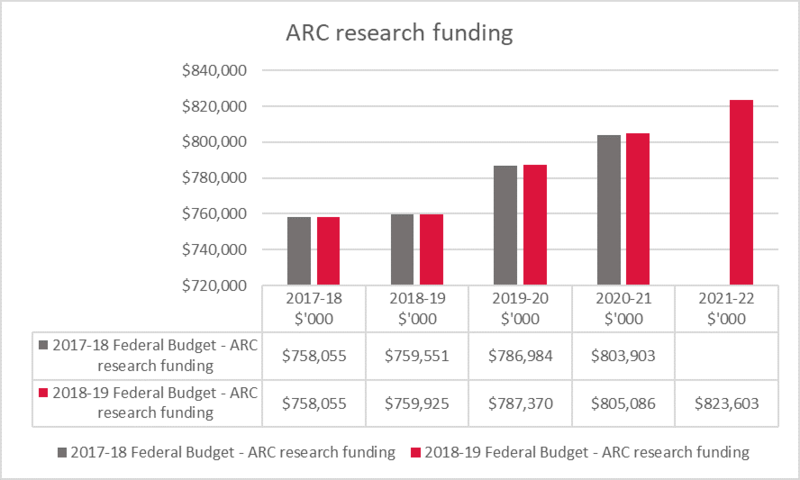 Australian Research Council funding will grow at a very slightly increased rate compared to the previous budget. The Government has announced an addition $1.9 billion over 12 years from 2017-18 ($393.3 million over five years) to implement the Research Infrastructure Investment Plan, informed by the 2016 National Research Infrastructure Roadmap. Further details are provided below in the NCRIS section. The Government will provide $70.0 million in 2017-18 to replace and upgrade Australia’s computing and data capability at the Pawsey Supercomputing Centre, which is a critical component of the national research and innovation system. There will be major changes made to the R&D tax incentive in response to the recommendations of the 2016 Review of the R&D Tax Incentive. The changes will apply for income years starting on or after 1 July 2018. For companies with aggregated annual turnover below $20 million, the refundable R&D offset will be a premium of 13.5% above a claimant’s company tax rate. Cash refunds from the refundable R&D tax offset will be capped at $4 million per annum. R&D tax offsets that cannot be refunded will be carried forward as non-refundable tax offsets to future income years. Importantly, refundable R&D tax offsets from R&D expenditure on clinical trials will not count towards the cap. Combined Government and private sector funding of $500 million will continue to be invested in the Biomedical Translation Fund (note this is not new or additional funding, and has been previously announced). The Government will provide $1.0 million over two years from 2018-19 to support a review of existing and international measures of innovation. The review will inform the development of new metrics that will ensure innovation is accurately measures in Australia. The Government will provide $29.9 million over four years from 2018-19 to strengthen Australia’s capability in Artificial Intelligence (AI) and Machine Learning (ML). The measure will support business innovation in sectors such as digital health, digital agriculture, energy and cybersecurity. This will include $25.0 million allocated to the CRC programme to support programs in this area (see below). The Government will provide $4.5 million over four years from 2018-19 to encourage more women into STEM education and careers. The funding will progress the Women in Science Strategy; a decadal plan for women in science; work on the new Women in STEM Ambassador; the development of a STEM Choices resources kit to address the under-representation of girls in STEM education. The Government will provide $20.5 million over four years from 2018-19 for the implementation of new data governance arrangements in line with the recommendations of the Productivity Commission’s 2017 Report on Data Availability and Use. A data sharing and release framework, underpinned by legislation, will be developed and administered by a newly established National Data Commissioner (NDC). The Government will provide $0.6 million in 2018-19 to fund the development of a detailed business case to modernise IP Australia’s patents management system. The Government will remove customs tariffs from placebos and clinical trial kits that are imported into Australia from 1 July 2018. The Government will provide $20.0 million over four years from 2018-19 to establish the Asian innovation Strategy. This funding will include an extension for the Australia-India Strategic Research Fund for an additional four years. The Government will provide $7.7 million in 2018-19 to fund immediate and critical radioactive waste management and nuclear decommissioning activities to ensure the continued protection of both the community and the environment. 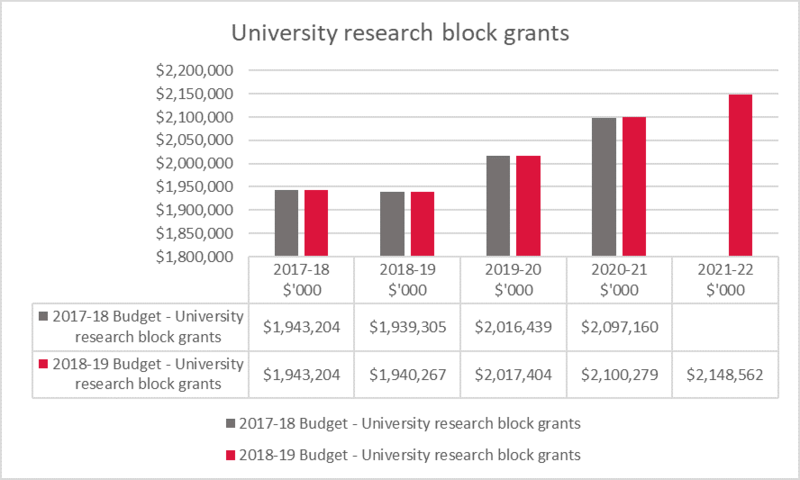 Funding for research through university research block grants will increase very slightly compared to previous forecasts. No specific measures were announced. 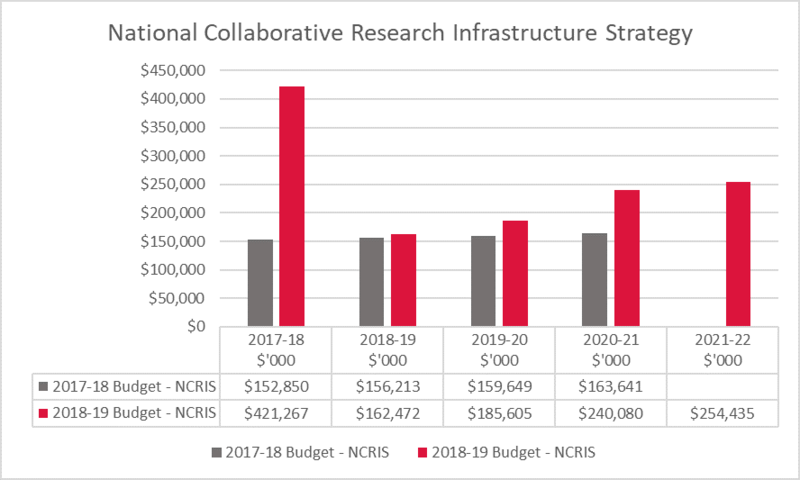 The Government has announced an addition $1.9 billion over 12 years from 2017-18 ($393.3 million over five years) to implement the Research Infrastructure Investment Plan, informed by the 2016 National Research Infrastructure Roadmap. Implementing the plan will involve partially funding specific national research infrastructure, with the Government’s contribution contingent on co-investment being secured by the project’s proponents. Projects will be delivered through an expansion of the existing National Collaborative Research Infrastructure Strategy (NCRIS). 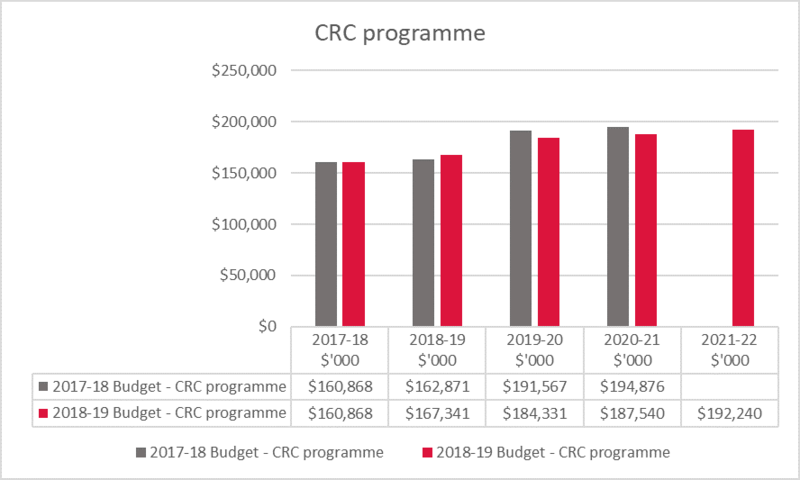 The Government will achieve efficiencies of $30.0 million over two years from 2019-20 by returning uncommitted funding to the Budget from the Industry Growth Centres Initiative and the Cooperative Research Centres Program. Additional funding of $25M will be provided over the forward estimates through the CRC program to support projects into Artificial Intelligence and Machine Learning. 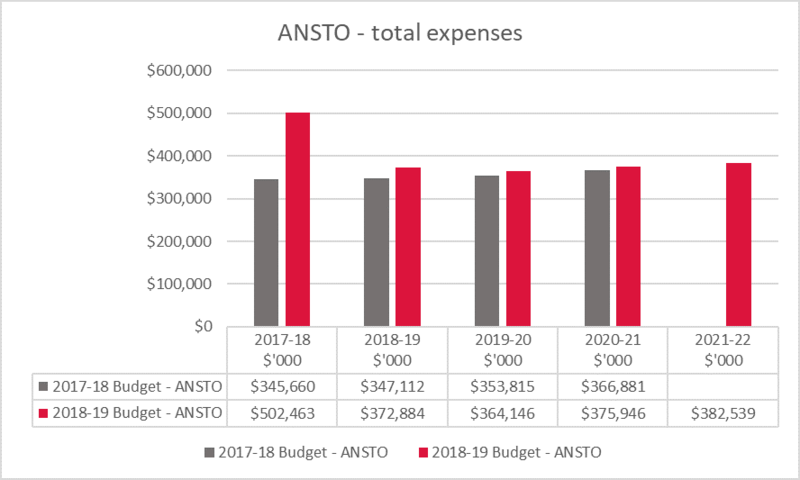 Funding for ANSTO will be significantly higher in 2017-18 than previously forecast, and slightly higher for the outward years of the forward estimates.